In 1912 Charles M. Russell completed one of his most famous paintings, "The Exalted Ruler". 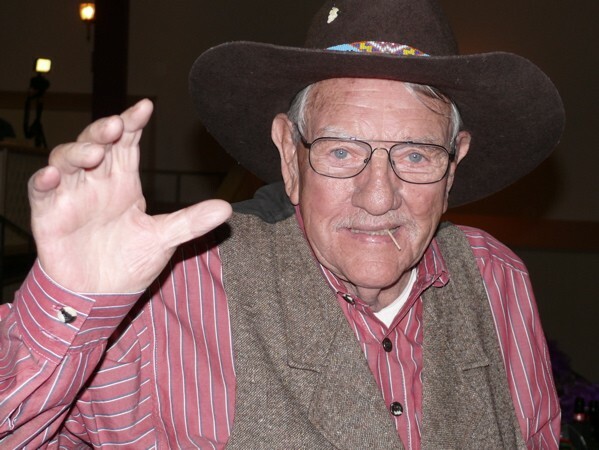 After completing he gave the painting to the newly completed Great Falls Elks Lodge where it hung until 1985. The painting was placed on loan to the C.M. Russell Museum. 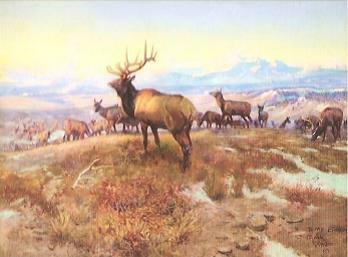 In 1994, the Great Falls Elks Lodge decided to sell the painting with a price of $1.2 million. Under the agreement with the Great Fall Elks Lodge, the museum had to raise funds and make the purchase by April 30, 1995. The Museum launched campaign entitled in for the Ruler with a theme of "Give us an inch... so we can keep the Ruler." Each gift of $250 received allowed the Museum to purchase one square inch of the painting. Approximately 69 local schools participated, including one class of 15 students alone raising $1,000.00. Looking at the picture “The Exalted Ruler” you will see an Elk in the middle. It is symbolic of the President of the Elks Club "The Exalted Ruler". On the left is the out-going "Exalted Ruler”, a big bull with a large rack. On the right is another bull with a rack who is next year’s "Exalted Ruler". Just to the left of this one is a bull with spike horns and is the future "Exalted Ruler". In front is a bird by a rack of horns hiding, the past "Exalted Ruler." You can tell the citizens of Great Falls knew how lucky they were to have this in their possession. The communities, especially the schools were able to keep the original painting, piece by piece. Now for our story, our very own Al Huffman, being recognized again for his Great Western Prowess was awarded a limited edition print of "The Exalted Ruler". We at Lodge 2363 are extremely lucky to be able to have this print hanging downstairs in our club-room. Thank You to Al Huffman for graciously giving this print to our Lodge for all of us to enjoy. Also thanks to David Dey for making the beautiful frame and to Deborah Carballeira for helping with the name plate.